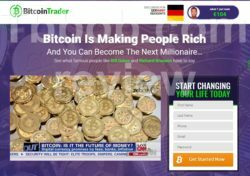 In this review of the Bitcoin Trader we show that this program is a scam that you have to avoid. The Bitcoin Trader app is allegedly based on the most advanced trading algorithms, so it wins 99.4% of all trades. As its name suggests, it is trading the Bitcoin. And wait, there is another miracle, the Bitcoin Trader is free, so you allegedly can become rich for free. Really? Free money does not exist, so you guessed it, Bitcoin Trader is a scam that will take your money and lose it. It is not free. No trading software in the world can win 99.4% of all trades. It is just impossible. Any software promising you such a win ratio is a scam. Period. Here is the proof that Bitcoin Trader is a scam. Look at the testimonials, you will see that scammers used stock photos with fictitious stories. People you see on the pictures are not real users of the program, they don’t even know that it exists. All the testimonials are fake. We wanted to test the Bitcoin Trader app to see how it works, but surprise, after registering we were immediately redirected to a deposit page of the broker Toroption. By the way Toroption is an unregulated and scam broker that regulators warn about. The reason for this step is that people who run the Bitcoin Trader are associated with this broker, they get money for referring new depositors. This is all that this program is about, earning affiliate commissions to people who run it. If you join it and deposit money with it, you will never see it again. 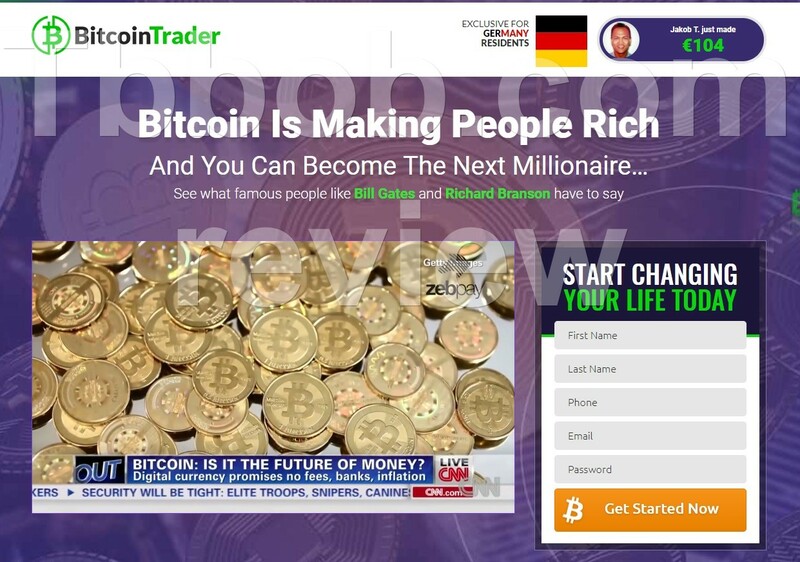 The Bitcoin Trader is a simple scam that abuses cryptocurrencies, it will make you deposit and lose money with a broker that is not regulated. To make money in trading, you need to develop a profitable strategy, you cannot click trades without preparation. You can try everything on a free demo account with a regulated broker. Don’t trade with real money unless you are sure that your strategy works.